Zeke's Landing Marina is a six-acre complex located on Cotton Bayou in Orange Beach, Alabama, less than ten minutes by boat from the Gulf of Mexico. It's marine facilities include 50 wet slips, a 250-boat dry stack storage facility, a full service dock store and fuel station. 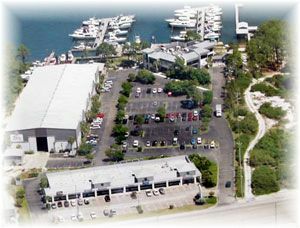 The marina is the home of Zeke's Charters, the Gulf Coast's largest Charter Fishing Fleet. Also on-site are three of the areas favorite restaurants, a gift and beachwear shop, parasail & water craft rental service, a boat & yacht brokerage, a marine electronics store, a fresh seafood market, a live bait shop, and a donut shop. 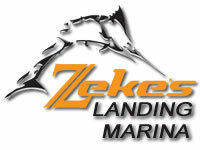 Zeke's Charter Fleet offers the ultimate deep sea or inshore fishing experience on one of over thirty charter boats. Private trips are available and should be booked in advance, or stop in the Charter Fleet office to book a walk-on trip. For a day of fun fishing or just cruising for the whole family, our own 60 passenger Zeke's Lady cruises daily for 4 or 6 hour trips. Visit our website for more details and be sure to check out our live streaming webcams. Check Out Our Website For Live Web Cams featuring Streaming Video! * NOTE: Click '+' to zoom in or '-' to zoom out. Click 'Aerial' to switch to aerial photography mode. Click 'Birdseye' to switch to Bing Virtual Earth 2D photography mode.